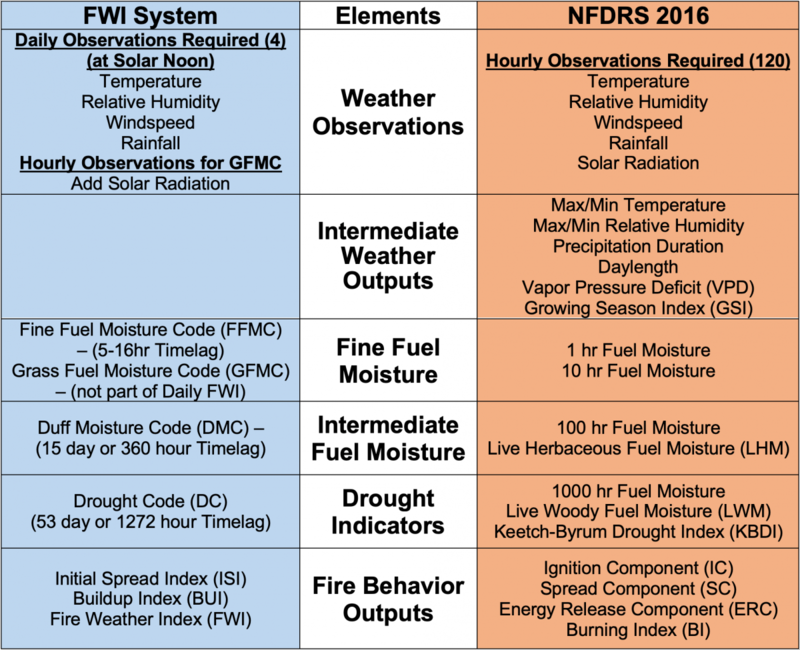 Analogous in concept to the National Fire Danger Rating System (NFDRS), the FWI System depends solely on weather readings. Resulting fuel moisture codes and fire behavior indices are based on a single standard fuel type that can be described as a generalized pine forest, most nearly jack pine and lodgepole pine. The Fire Weather Index System calls for weather observations to be collected from a standard observation site and time. Location standards can be found in the, Weather Guide for the Canadian Forest Fire Danger Rating System (Lawson and Armitage, 2008). The system calls for observations to be taken at solar noon, when the sun is at its peak directly overhead. This table provides the crosswalk between FWI weather inputs, fuel moisture codes, and fire behavior indices with their NFDRS counterparts. 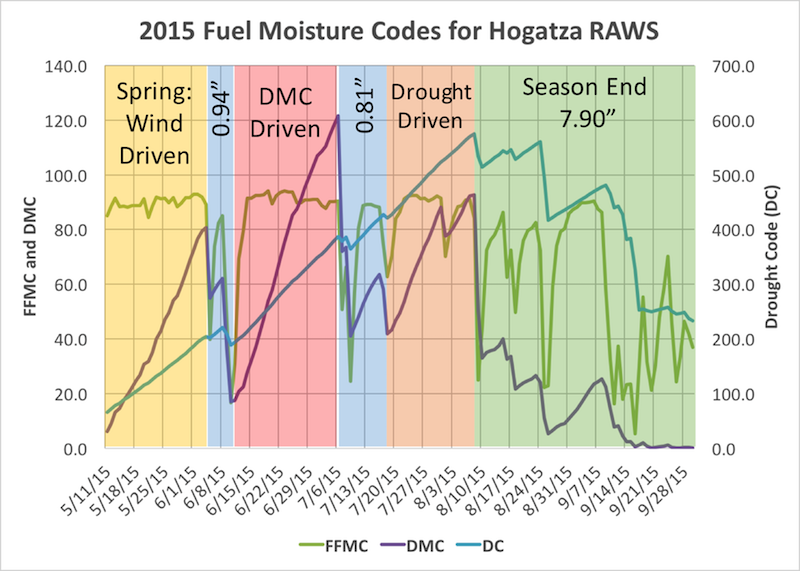 There are 3 fuel moisture categories, or codes, in the FWI system, compared to 7 found in NFDRS. These are generally represented as unitless codes instead of fuel moisture content (represented as a % of dry weight). They can be converted to moisture content, and in fact, are converted each day as part of the daily or hourly calculations. The Fine Fuel Moisture Code (FFMC) represents fuel moisture of forest litter fuels under the shade of a forest canopy. It is intended to represent moisture conditions for shaded litter fuels, the equivalent of 16-hour timelag. It ranges from 0-101. Subtracting the FFMC value from 100 can provide an estimate for the equivalent (approximately 10h) fuel moisture content, most accurate when FFMC values are roughly above 80. The Duff Moisture Code (DMC) represents fuel moisture of decomposed organic material underneath the litter. System designers suggest that it is represents moisture conditions for the equivalent of 15-day (or 360 hr) timelag fuels. It is unitless and open ended. It may provide insight to live fuel moisture stress. The Drought Code (DC), much like the Keetch-Byrum Drought Index, represents drying deep into the soil. It approximates moisture conditions for the equivalent of 53-day (1272 hour) timelag fuels. It is unitless, with a maximum value of 1000. Extreme drought conditions have produced DC values near 800. This example plot of all three moisture codes through a fire season demonstrates how fuel moisture codes rise as fuels dry out, and falls with precipitation and (primarily with FFMC) with moderating weather. In this way, these fuel moisture codes can more easily provide visual comparisons with the associated fire behavior indices. Among them, the DMC and DC are effectively open ended codes with little chance environmental conditions will produce maximum values. The Initial Spread Index (ISI) is analogous to the NFDRS Spread Component (SC). It integrates fuel moisture for fine dead fuels and surface windspeed to estimate a spread potential. 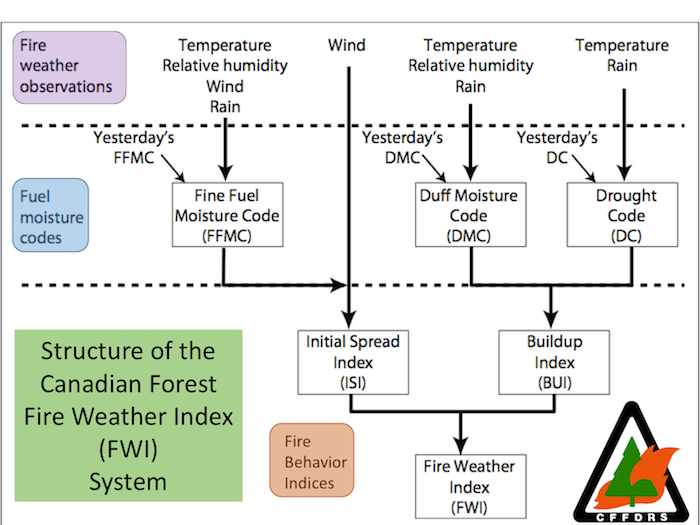 ISI is a key input for fire behavior predictions in the FBP system. It is unitless and open ended. The Buildup Index (BUI) is analogous to the NFDRS Energy Release Component (ERC). It combines the current DMC and DC to produce an estimate of potential heat release in heavier fuels. It is unitless and open ended. In Alaska and the Lake States, it is the primary indicator of season severity during the growing season. 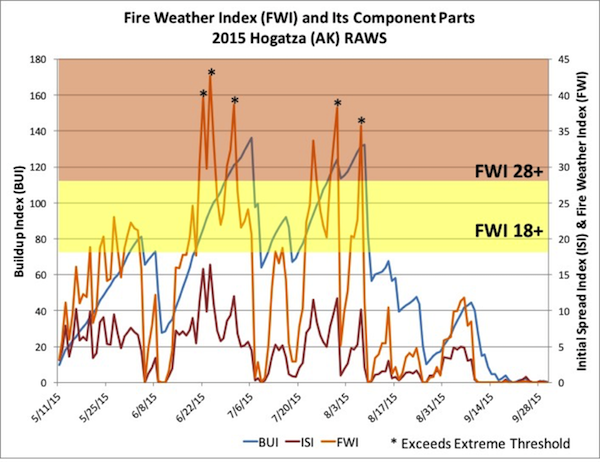 The Fire Weather Index (FWI) integrates current ISI and BUI to produce a unitless index of general fire intensity potential. It is analogous to NFDRS Burning Index. With dry fuel conditions, it is a key indicator of extreme fire behavior potential. Again, unitless and open ended. As shown in this graph, the FWI integrates the influences of spread (ISI) and fuel flammability (BUI) to produce a unitless index of potential fire intensity and prospect for extreme fire behavior. The GFM is a fourth fuel moisture category for grass fuel moisture specifically (Wotton, 2009). It is not part of the daily FWI system. Research in Ontario (Kidnie et.al, 2010) quantified the fuel moisture trends for grass fuels and established a grass fuel moisture model that is produced only with hourly data. 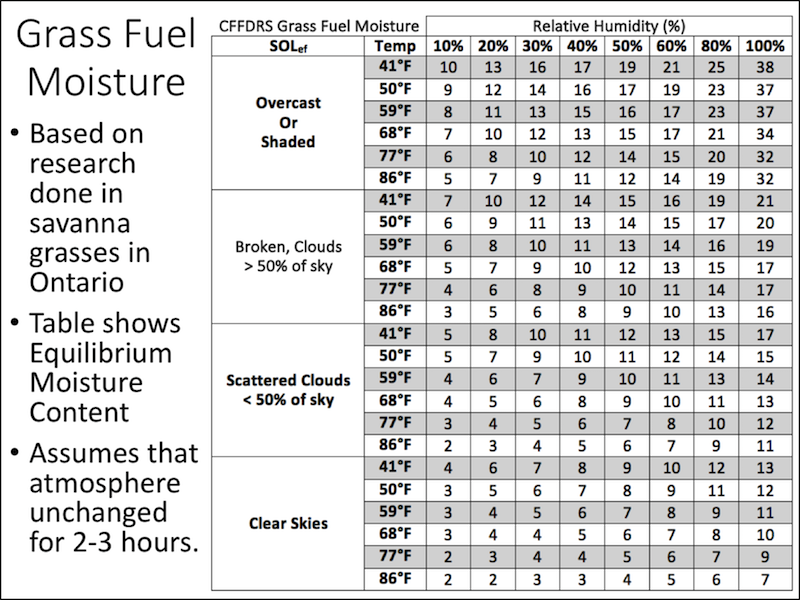 Its corresponding Grass Fuel Moisture Code (GFMC), along with the FFMC, provides hourly estimates to represent diurnal and event based changes in fine fuel moisture as they occur. There is an hourly version of the Fine Fuel Moisture Code that reflects variability influenced by temperature and humidity changes throughout the day and night. Using the corresponding, locally observed windspeed, updated values for Initial Spread Index and Fire Weather Index may also be produced. Daily records are generally started as soon as there is measurable fire danger in the spring. Where winter snow cover is continuous, this is defined as the third day after snow has left the area to which the fire danger rating applies. Default seasonal start-up values are 85 for FFMC, 6 for DMC, and 15 for DC. If daily observations are interrupted during the season and missing observations cannot be estimated, fuel moisture codes must be estimated for the last day of missing observations and used as “yesterday” fuel moisture codes for the newly resumed weather observation.